Since Nintendo has not yet announced any plans to revive the Game Boy handheld console just like it did with the NES and SNES consoles, other companies may transform this into their advantage. Hyperkin presented an Ultra Game Boy that adds all the features the fans of the classic wanted, also requiring the original cartridges. The handheld consoles had a big impact in the early ‘90s and one of the most successful device from this era was Nintendo’s Game Boy launched in 1989. It dominated the handheld console market for almost 10 years and it paved the way for the 3DS and the Switch, being every bit as iconic as the original NES and the SNES TV consoles. Nintendo has recently already launched revived versions of its original TV consoles, which sold like hotcakes and still sell immediately every time new stock comes in, so we could see a revived version of Game Boy soon. 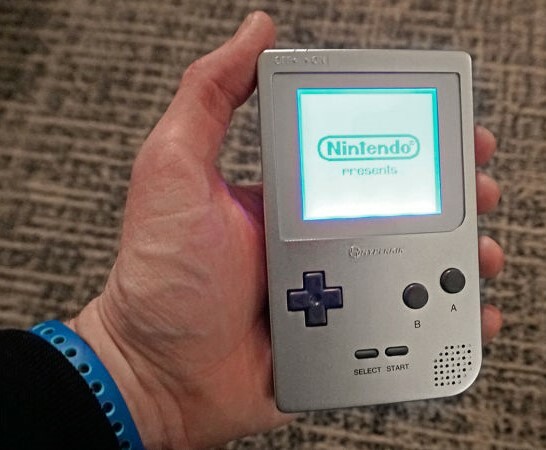 Hyperkin already thought ahead and is planning to capitalize on this prospect with an updated version of the legendary handheld console named Ultra Game Boy that was presented at CES 2018 this week. Hyperkin’s updated handheld console will probably not end up using copyrighted names from Nintendo, as Ultra Game Boy is just a development moniker. The development prototype showed at CES 2018 improves on almost every aspect of the classic handheld, but still requires the original game cartridges. An aluminum case that feels so much better than the original bulky plastic is now provided, making the console more durable and a bit lighter. Hyperkin’s design includes the contrast and volume dials from the original, but also adds a new dial that cycles through the whole RGB spectrum for the screen backlight color, allowing users to completely turn the backlight off, as well. Other new features include a six-hour battery with an USB Type-C connector for charging, stereo speakers and left and right audio-out connections that allow chiptune musician to create electronic tunes based on the original mono sounds. The revamped Game Boy is expected to be ready for shipping some time this year, and Hyperkin hopes it can deliver everything under US$100. The absence of built-in games might prove a bit awkward, and Nintendo could take advantage of this aspect, but Hyperkin will most definitely have the head start.